It is ideal to topdress (spread soil) your lawn once a year. If you topdressed in the spring, than just overseed and fertilize at this time of year (the fall). Even if your lawn is looking healthy and green, still topdress, seed and fertilize – don’t wait until it stops looking great before you follow the steps below. By keeping up on your lawn every year, you’ll have less weeds, disease and insects invade – and less stress! If it all seems like too much, just overseed – overseed, overseed, overseed! I know some people that overseed every month and their lawn is nice and thick and healthy. Below we have listed the easy steps to topdress, seed and fertilize your lawn. 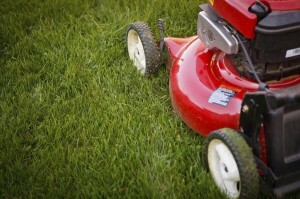 When cutting your lawn – wait until the grass has grown 6″ and set the mower to its highest setting and keep it there all season long to encourage deep rooting of your lawn. Watch our quick video below for a how-to on topdressing and overseeding – sorry about the vehicle noise and the agitated Mike – this is why we keep him out of the greenhouse and off the cash registers!! 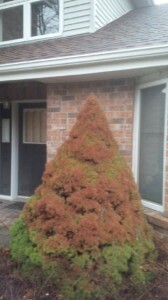 This entry was posted in landscape, lawn, natural, to do, Uncategorized and tagged do it yourself, fall, fall maintenance, fertilizer, gardens, georgina, georgina garden centre, grass cutting, grass seed, healthy lawn, how to, keswick, landscape, lawn, lawn maintenance, natural, organic, outdoors, overseeding, soil, to do, top soil, topdressing, watering on October 1, 2018 by Online Graphics. Are skunks or raccoons digging up your lawn? 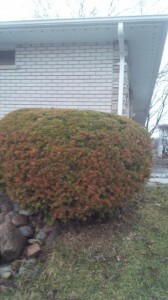 Do you have large patches of dead grass? These are sure signs you have grubs. Grubs are the larval stage of May/June Beetles, Japanese Beetles and European Chafers. You can use natural Lawn Guardian which consists of beneficial nematodes that are microscopic worms and are native to Canada. Applying beneficial nematodes will stop grubs from damaging the roots of the grass. It is safe to apply to the garden as well. Apply in the spring (April-May) when the soil temperature is 10C or warmer and grubs are seen in the soil. Apply again in late summer (end of August-September) to prevent fall damage, as well as, the following spring. Repeat applications every year (spring and late summer). Beneficial nematodes also help control over 250 insect pests including: Rose Chafer, Rose Midge, Thrips, Birch Leafminer, Cranefly/Leatherjacket, Root Weevils, Fleas, Iris Borer, Cutworms, Webworms, May/June Beetles, Japanese Beetles & European Chafers! Note: Beneficial nematodes are most effective when soil is moist and remains moist for 3 to 5 days after application. Lawn Guardian is easy to apply using a hose-end sprayer and comes with full instructions. Application of 10 million nematodes should take approximately 40 minutes to apply using our hose end sprayer and will cover an area of 2000-3000 sq ft. 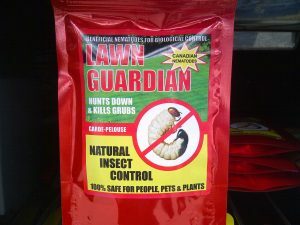 This entry was posted in natural and tagged beneficial nematodes, brown lawn, dead spots in grass, fall, garden, georgina, georgina garden centre, grass, grubs, integrated pest management, lawn, lawn maintenance, natural, natural insect control, natural pest control, organic, spring, white grub on August 18, 2018 by Online Graphics. Corn gluten is natural and non-toxic. It prevents seeds from germinating – it won’t get rid of existing weeds (those you’ll have to pull or spray), it can inhibit more seeds from germinating. While effective, its application timing also has to be precise – you apply corn gluten in early spring and late fall. Apply corn gluten to your lawn with a spreader – not by hand. Apply the corn gluten to a moist lawn but be sure that the corn gluten will stay dry for 48 hours after application. Allow 6 weeks before/after overseeding your lawn with grass seed, as corn gluten will inhibit the germination of any grass seed you put down. Apply corn gluten in April – May depending on weather – before the Forsythia finishes blooming. This entry was posted in landscape, natural and tagged corn gluten, crabgrass control, dandelion control, fertilizer, fertilizing, georgina, georgina garden centre, grass seed, healthy lawn, how to, keswick, landscape, lawn, lawn maintenance, natural, natural pest control, outdoors, overseeding, shop local, spring, spring maintenance, to do, weed control, weeds on May 9, 2017 by Online Graphics.